8th Grade is turning politics into projects. Earlier this year, the 8th grade class of 2023 worked hard on a project based around the election’s candidates. They created projects and heavily researched an opinion their candidate has on a subject. For example, some groups made a trivia game based on their candidate while others may have made a scrapbook project to educate others on their candidate’s views and information. 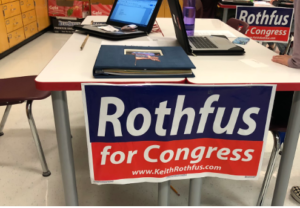 Students share their Rothfus scrapbook. After interviewing a few students from the 8th grade, it became clear that the students were more involved in the election because of the project. “I knew what was happening and I wanted to pay attention,” said 8th grader Tess Pappas. Some students, after researching their candidates, would not have voted in their favor. On the other hand, some students would have voted for their candidate over the other option(s). Running this year for Pennsylvania governor was Democrat Tom Wolf, Republican Scott Wagner, Liberal Kenneth Krawchuk, and Green Party Representative Paul Glover. Tom Wolf had a total of 2,829,902 votes or 57.6% of the votes. He beat Scott Wagner by 731,133 votes or 16.8%. Kenneth Krawchuk and Paul Glover received a small percentage of votes. For Pennsylvania State Senator, the candidates were Democrat Bob Casey, Republican Lou Barletta, Libertarian Dale Kerns, and Green party Representative Neal Gale. Bob Casey won, he had 2,725,199 votes (55.6%). Then, was Lou Barletta, who had 2,098,769 votes (42.8%). Dale Kerns only had about 1% of the votes, and Neal Gale had around .6%. The last election that would be affecting part of the Allegany County and Beaver County was the District 17 House District Elections. Conor Lamb and Keith Rothfus ran for this position. Conor Lamb won with a total of 176,293 votes, leaving Keith Rothfus with 137,906 votes. In a poll that was sent out to the handful of seniors able to vote this year, two voters responded with opinions on who they would vote for. Both voted for Tom Wolf, Bob Casey, and Conor Lamb.